See full text for more information. First discovered in 2011 , MXenes have gained much attention due to their unique electrochemical, electrical, and optical properties. These two-dimensional transition metal carbides and nitrides have a unit formula of Mn+1XnTx, where M represents an early transition metal (Sc, Ti, V, Cr, Mn, Y, Zr, Nb, Mo, Hf, Ta, or W) and X represents either carbon or nitrogen. Txcorresponds to MXene surface functional groups, such as –OH, –F, and –O. There are more than twenty different MXene compositions synthesized to date, such as Ti3C2, V2C, Nb2C, Mo2C, and Mo2TiC2. A complete list of MXenes can be found elsewhere . Some of the ever expanding applications for MXenes include electrodes for batteries and supercapacitors, electromagnetic interference shielding, antennas, neural interfaces, water desalination, and catalysis . The oxidation stability of MXenes, which are metastable 2D metal carbides and nitrides, depends on their composition, structure (flake size and concentration of defects), morphology (that is, single or multilayer flakes, powder, or films), and storage conditions (for example, colloidal solution or air). Since MXenes are made via solution processing, it is common to store the 2D flakes in water or organic solvents as colloidal solution (ink) . When stored as solutions, MXene flake size, as well as liquid medium type, dissolved oxygen, and temperature, has a large impact on the oxidation rate . For example, Ti3C2Tx flakes with 600?±?200?nm lateral size were shown to be stable in water when stored in argon-sealed vials at ∼4?°C (in a refrigerator) for 25?days with only 1.2% degradation. However, similar flakes were shown to oxidize completely in fifteen days when solution was stored at room temperature in air. 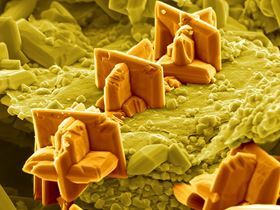 As oxidation progresses, particles of anatase (TiO2), up to a few hundred nanometers in size, form along the edges of the flakes, and much smaller anatase nanoparticles (2–3?nm in size) are formed on the basal planes as well, which suggests that the edges of the flakes are the most active sites for oxidation . When a single flake of Ti3C2Tx was deposited on a Si/SiO2 substrate, its conductivity read 4600?±?1100?S?cm−1. Upon exposure to air, although the flake’s conductivity was reduced due to partial oxidation, it remained conductive after 70 hours in air at 25?°C and 50% humidity . Making a MXene film by vacuum-assisted filtration of its colloidal solution significantly improves the material’s stability in air. For example, a 5-µm-thick filtered film of Ti3C2Tx was stable up to 30?days of storage at room temperature in air, which can be explained by the compact morphology of the film that prevents interaction of the inner MXene flakes with air . In theory, MXene multilayered powders (that is, the powder immediately after etching and before delamination into single flakes) should have similar stability to MXene films, however, no systematic study of MXene powder oxidation is available to date. While the unintended oxidation of MXenes tends to render the material useless for some of its intended applications, a controlled oxidation of MXenes can be used to create transition metal oxide particles on sheets of MXene or carbon. Unlike the multi-step methods of making hybrid structures of metal oxides with graphene or other carbon allotropes, oxidation of MXenes presents a simple method yielding a similar result. Carbon-supported metal oxides’ hybrid structures have been explored for various applications, including water treatment , lithium-air batteries , catalytic converters for exhaust systems, , and solar cells . These hybrid systems offer a combination of properties from their individual components. For example, TiO2 particles may act as a photocatalyst to degrade pollutants in water or air; however, with no support, they agglomerate, which drastically reduces the effective surface area. Supporting TiO2 on activated carbon can improve its efficiency without inhibiting UV light required for the reaction . Recently, other carbon morphologies have been explored for supporting metal oxides, including graphene sheets. However, these hybrid systems require multi-step syntheses . A one-step process of growing TiO2 particles on graphitic carbon was developed by flash oxidation of MXene powders at 1150?°C for 30?s in air, resulting in a controlled oxidation of Ti3C2Tx flakes . Other one-step oxidation methods such as hydrothermal, heating in CO2, and H2O2-assisted oxidation  have also been demonstrated. All of these methods, while resulting in slightly different oxide crystal sizes and morphologies, produce carbon-supported transition metal oxides. In addition to being single-step, this method also produces materials with fewer wrinkles and agglomerates than the bottom-up approaches . Additionally, these MXene-sourced carbon-supported metal oxides have fewer defects, leading to better properties. Anatase on graphitic carbon produced via the flash oxidation method shows great performance as an anode material in lithium ion batteries . A similar hybrid structure of TiO2 on 2D carbon sheets was produced via annealing of Ti3C2 at 800?°C for 1?h in CO2 atmosphere, and showed excellent performance as a microwave absorber . Other MXenes, besides Ti3C2, can also be oxidized to form graphitic carbon-supported metal oxides as well. Nb2C was oxidized to form carbon-supported orthorhombic Nb2O5, which was used to create high-capacitance electrodes for lithium ion capacitors . In general, controlled oxidization of MXenes is a simple method to make dozens of carbon-supported metal oxides for various applications including catalysis, energy storage, photovoltaics and optical sensors . The cover shows a Ti3C2Tx powder that was flash oxidized at 1100?°C for 30?s. To do so, MXene powder was placed in an alumina boat, followed by pushing the boat to the furnace hot zone in about 5?s, held there for 30?s, and removed in 5?s. The micrograph was obtained with a Zeiss Supra 50 scanning electron microscope using InLens mode, at Drexel University Core Facilities. The width of the micrograph is ∼9?µm. We acknowledge the use of SEM of the Core Research Facilities (CRF) at Drexel University. A new electron microscopy technique has revealed how atomic species attached to layers of the 2D material MXene can affect its properties. Researchers have used a novel cold sintering process to produce, for the first time, a composite made from a ceramic and the 2D material MXene.